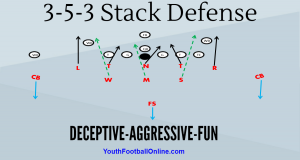 Here are the best youth football drills for each position. The game of football is won at the line of scrimmage. It’s important that you work with your offensive line throughout the practice week. We utilize individual position periods at least three times a week. During these periods we will work on everything from our line split to run/pass blocking technique. If you want your offensive linemen to block well you have to have them practice blocking. Run blocking is all about attitude and competitive. Here are several offensive line drills that you can utilize this season. When it comes to youth football, speed kills. You always want to do drills that will develop RB speed and agility. Playing running back requires your player to be fast and agile, but always very physically and mentally tough. Since running backs are touching the ball pretty much every play it’s important that they are able to secure the football. We tell our kids all the time that if they can’t hold onto the football, then they will not carry the football. Playing running back goes well beyond just running the football. Running backs need to be able to block as well. Sometimes they will have to lead block, seal block, wham, or execute a kick-out block. You running backs should be practicing blocking just as much as the offensive line. Coaching wide receivers is somewhat tricky in youth football. It’s important to keep in mind that playing receiver doesn’t just mean that they are going to run patterns and catch passes. Receivers are ask to run routes and catch passes, but they are also required to be able to block. Receivers in youth football will do much more blocking than they will do route running and catching. Regardless of your offense, receivers need to be able to block. Receivers could be ask to stalk block, crack block, or even lead block on some plays. Receivers have to take pride in their blocking. Our receivers practice blocking just as much as our offensive line. The quarterback is the leader of the offense. He must be able to take control and demand the respect of his team. 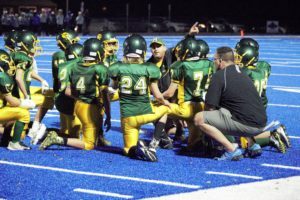 In youth football, the QB needs to be a kid that can lead and communicate with his teammates. He needs to be a kid that when he talks, the kids listen. Playing QB is very difficult and it requires you to touch the football every single play. QBs need to be able to take snaps, execute handoffs and toss, remember the plays, and of course he must be able to throw the football. The game of football is won on the line of scrimmage. If you defensive linemen can’t maintain their gaps then your defense is in for a long day. Your defensive linemen are responsible for anchoring their assigned gaps and freeing up the linebackers run and make tackles. Defensive linemen must be disciplined, they must be able to get penetration on passing and goal-line situations. Defensive linemen must be able to play with low pad level and they must be very physical. We spend a lot of practice time working with our defensive linemen. Speed kills! That’s the case for every age level of football. Good football players are fast football players. As a coach, you should prioritize speed and agility develop during the practice week. Every week your team needs to become faster and more agile. One way to help combat this is by focusing on conditioning using position specific drills. This accomplishes two goal. The first is that it helps to keep players entertained where they are becoming conditioned without realizing it. The second thing is that it maximizes time. In the Youth game there is never enough practice time. If a team spends 30 minutes conditioning by running sprints it has taken away 30 minutes of time that could be used to develop skills. By using position specific drills at a high tempo to condition players the coach can both develop the players skills and conditioning at the same time. Play Burst Model because players should have a burst of energy similar to a play. This helps condition their bodies to what the game will actually be like. Using the Play Burst Model for Offensive Line all players will be on a yard line and the coach will tell them the play they will be running. When the Coach yells go the players will do their footwork for the first 5 yards of the play and then finish with a 5 yard sprint. For example, if the play is Inside Zone right when the Coach yells go each lineman will execute their Inside Zone steps for 5 yards. When they reach the 5 yard line they will sprint 5 yards to the next 5 yard line to simulate chasing the ball downfield. They will then line up on the next line and get the next play. Done effectively this can be a great way to review player’s footwork while also getting in conditioning. The play burst model can also be effective for Wide Receivers with a few tweaks. When working Play Bursts with WRs the coach should set up a circuit where the receivers will run one route after another with minimal time between the routes. The effect of this is for them to not only get their conditioning in but also get practice running specific routes. When using the Play Burst Model you can run the receivers on routes every 10-15 yards. They will run the route, simulate catching the ball and accelerating up field to the next 5 yard line. There they will set up to run the next route. Again players are developing skills, route running and accelerating out of the catch, while also working on their conditioning. Running Backs can use the Play Burst Model to condition effectively but there are other options available to specialize even more. The best way to work on the conditioning of Running Backs is by using Ball Security Drills and add a finishing burst. A great example of this would be the staircase drill finished with a 20 yard burst. This can be sold easily to the players by telling them they are working to get through the line and the 20 yard burst is the end of the run. This can be done with any of the standard footwork drills for Running Backs. The ability to condition players through football specific drills is endless. The key is to sell the players that they are developing their skills while they are conditioning. When done effectively this increases motivation while also developing position specific skills.